Beautiful Gerberas are part of the daisy family, so it’s not surprising that they symbolise cheerfulness and innocence! If you’re looking to create a wedding theme which is both attractive and easy to incorporate, the Gerbera wedding invitation from Love Wedding Invitations provides a simple but bold design which you can easily feature throughout your wedding. The fifth most popular flower in the world, Gerberas are probably one of the happiest little flowers grown! With an array of colours ranging from orange and baby pink to red and bright yellow, a display of Gerberas at a wedding is the perfect way to naturally inject colour and happy vibes! 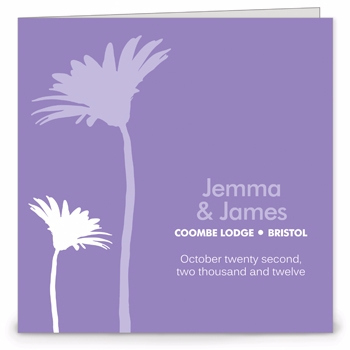 This gorgeous wedding invitation design features the silhouettes of two Gerberas, finished in either purple, white or lilac, depending on the individual stationery type. Standing proud next the modern composition of the Bride and Groom’s names, location and wedding date, they successfully create an understated contemporary look, fit for an array of modern weddings! Inside, your guests will find your wedding day details professionally printed in a modern font, making the most of the crisp look. The soft purple and lilac palette makes this design really easy to colour coordinate with other aspects of your wedding. We’re thinking purple ribbon around your wedding cake, pretty lilac bunting, mauve table decorations and of course, not forgetting gerberas in your bouquets! For those of you who aren’t a fan of fussy and glitzy designs, the Gerbera wedding invitation could be the one! It’s depiction of this super popular flower is sure to be a success amongst your wedding guests!